Akousmaflore is a small garden composed of living musical plants or flowers, which react to human gestures and light contact. Each plant reacts in a different way to contact or heat by a specific sound. The plant language occurs through touch and the close proximity of the spectator. Our invisible electrical aura acts on the plant branches and encourages them to react. The plants sing when the audience lightly stroke or pass in the immediate vicinity to them. A flower concert is created. 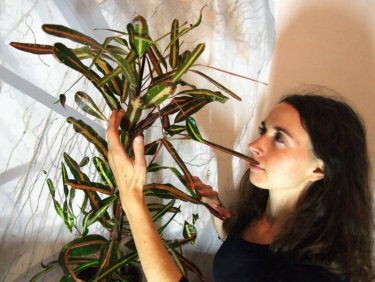 In our artwork, we create hybrids between plants and digital technology. Plants are natural sensors and are sensitive to various energy flows. Digital technologies permit us to have a relationship with plants and sound. We display the effects of random data flow and plant interaction. The data is modified as the spectator meanders around and touch the installation, resulting in a random musical universe. Audience gestures and movements generate sound effects and changes in the texture of the sound. Art : interactive, digital, participative, installation, design, music, architecture...are in projects created by Scenocosme. In scenocosme the duo artists Grégory Lasserre & Anaïs met den Ancxt, collaborate in order to conceive interactive original artwork’s. Their multiplidisciplinary approach allow us to create sensitive and interactive Artspace and Artwork.